Two long lines wrap through the Facilities Complex as the smell of BBQ fills the air. With over 900 employees in attendance, the Planning, Energy, and Facilities Services (PEF) BBQ has operated as a zero waste for three years, although few in attendance notice any differences from a typical event. 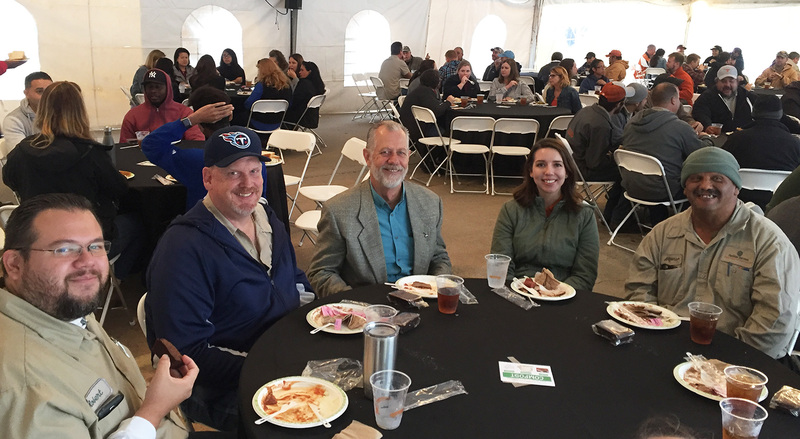 On October 18, Senior Vice President and Chief Financial Officer Darrell Bazzell recognized the successes of the PEF departments in his portfolio at their annual staff appreciation BBQ. He commended staff efforts to “face challenges while continuing to provide outstanding service to our university.” One of those challenges is reducing waste at events in line with the university’s 2020 Zero Waste goal. Each year, a little advanced planning is needed to coordinate with the caterer, order compostable serving ware, and arrange for compost collection. UT Resource Recovery advised the event coordinator and new caterer as to specific zero waste considerations, which are also provided in their online guide. The caterer took initiative in finding compostable packaging for meal items that were not already compostable, such as the individually wrapped dessert brownies. Based on this experience, the caterer intends to transfer best practices to improve diversion rates at their home operation. While trash cans were still needed for some back of house food preparation materials, this trash accounted for less than one percent of the event. Five Resource Recovery student interns conducted outreach during the meal. They helped to raise awareness about composting correctly, including the fact that although the plastic items at the event looked typical, they were actually made of compostable plant-based materials. Freshman finance major Jeremiah recalled, “It was a joy to see the vast amount of people that make the day-to-day operations of the university successful.” He continued, “Some people were very excited to hear about how every item was compostable,” with a few staff noting that being able to compost made them feel good about their impact. As a result, only compost bins were present at the BBQ. And that’s because nothing ended up in a landfill. About the author: Lindsey Hutchison is a Zero Waste Coordinator in Resource Recovery and supervises the Student Internship Program. Resource Recovery is a branch of Facilities Services and is responsible for the efficient reuse and redistribution of campus resources and supports the campus in the implementation of programs to achieve UT Austin’s Zero Waste Goal.